Aw, you two look so much alike! 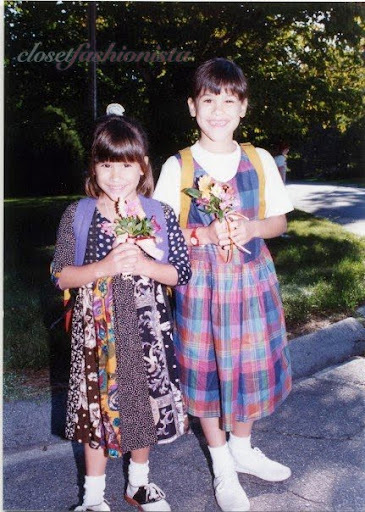 My sister and I definitely rocked the homemade dresses and scrunchies, too, lol. So many different patterns of the cloth! :) You both look adorable. you were so adorable! I really like those dresses with multi patterns, I've been thinking of getting one actually haha! I guess style hasn't really changed much eh?! totes adorb love it keep these coming I love throwback fashion..
Aww this is so cutee !! Be sure to check out my blog / giveaway ! Aren't you just the cutest little girl?! Awww, you and your sister are both adorable!! oh my goodness you are absolutely adorable! and that chocolate-dipped coat (and the pants that you showed me!) by Burberry are so, so, so gorgeous. But even on sale they are still pricey! The patchwark dress are amazing. OMG - I remember the patchwork dress I had. I was so proud of it 'coz my mum made it for me! so cute! and that's so cool that your mom made your dress. I'm so excited that you're up for a guest post! Thank you so, so much! okay this is beyond adorable!! aww yoo look so cute...and yeah what style for a 6 yrs old.cheers!! !